Discussion in 'UFC Discussion' started by Bels89, Aug 27, 2015. This is the perfect fight for both fighters. Both are up and coming contenders. Both guys are elite in different disciplines. Its perfect test for Thompson who would test his grappling and jiu jitsu defense and Nelson would go against Thompsons elite kickboxing. - both would have an advantage. This would clear some things up in the division. 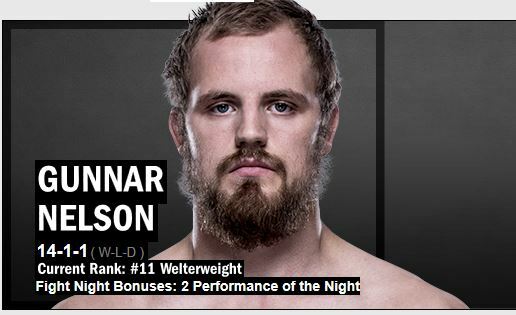 Not to mention that Gunnar trains with Connor and Thompson trains with Weidman, perfect matchup for UFC 194.
would love to see this fight. Do you think it happens at 194? Your probably referring to the Dublin card for the 1st fight but 194 is 4 months away. He should definitely take the fight, how long does he need to recover from being "banged up"
Gunnar is to good on the ground. He subs him within 2 rounds. Thompson's grappling is much improved, and he could keep things standing and not get dropped, like Thatch. I'm not buying into Gunnar, as much, since he got embarrassed by Rick Story. Still, it's a great fight, and a win for Wonderboy could launch him into the Top 8, even Top 7 in the division. I don't think it's a fight that makes alot of sense. Both guys have lack a win against a big name veteran, and have proven that they deserve a chance to earn one. If they face off against each other, no matter who wins, they still stand in the same position. Well Robbie's the champ and he's a striker, so I don't think they need to fight Hendricks, Rory or Woodley to get a title shot. Thompson isn't young, either, so he doesn't need as much building up and avoiding tough fights, but rather take on the best guys since he beat Ellenberger. The winner of this fight should get a title eliminator. Or Gunnar sleeps within rd 1. Heel injury needs to heal. If you look past the highlights of Wonderboy. You'd see that he has really good hands and equally heavy. He is very good, but has bad wrestling, and his striking is still a work in progress too. I am still not convinced. Brandon Thatch isn't exactly a world beater. Has anyone ever thought of Tarec vs Wonderboy? That is a lottttta side stances and bouncing. yeah great matchup but I kinda want them to fight later on not right now. a #1 Contender match after they both win a Cpl more.